Telephone Box In 1935, the K6 was produced to commemorate the Silver Jubilee of King George V, and was the first telephone box to be used extensively outside London – over 65,000 were built! 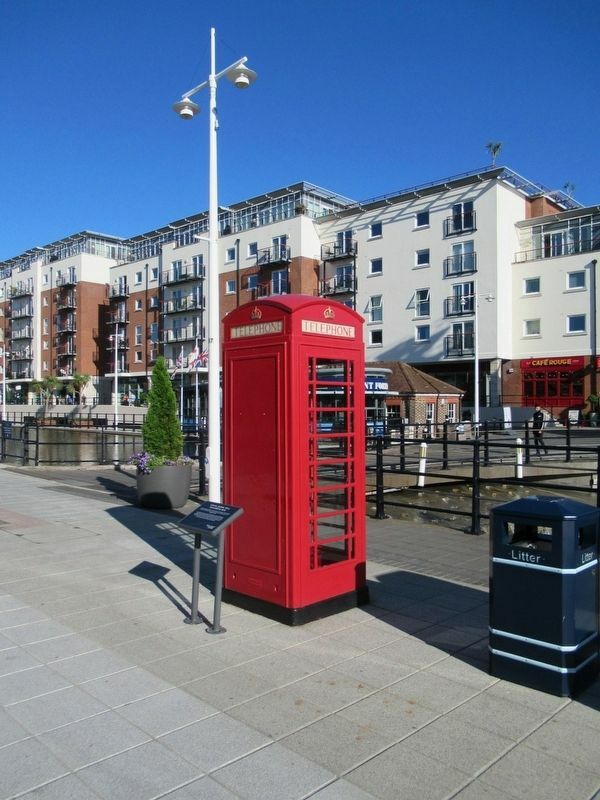 This telephone box was originally in Fort Blockhouse within HMS Dolphin in Gosport, and was donated to Gunwharf Quays by British Telecom in 2000. HMS Dolphin was the home of the submarine service for many years, and this kiosk was donated as a symbolic reminder of the submariners who served there and kept in touch with loved ones by telephone. Location. 50° 47.694′ N, 1° 6.384′ W. Marker is in Portsmouth, England, in Hampshire County. Marker can be reached from the intersection of Route B2154 and Park Road, on the left when traveling north. Touch for map. Located in the Gunwharf Quays mall. Marker is in this post office area: Portsmouth, England PO1 3TY, United Kingdom. Touch for directions. (a few steps from this marker); British MMK1 Mine (within shouting distance of this marker); Mark VIII Torpedo (within shouting distance of this marker); Noon Day Gun (within shouting distance of this marker); 12 Inch Shell (within shouting distance of this marker); HM Gunwharf, Portsmouth (about 150 meters away, measured in a direct line). Touch for a list and map of all markers in Portsmouth. More. 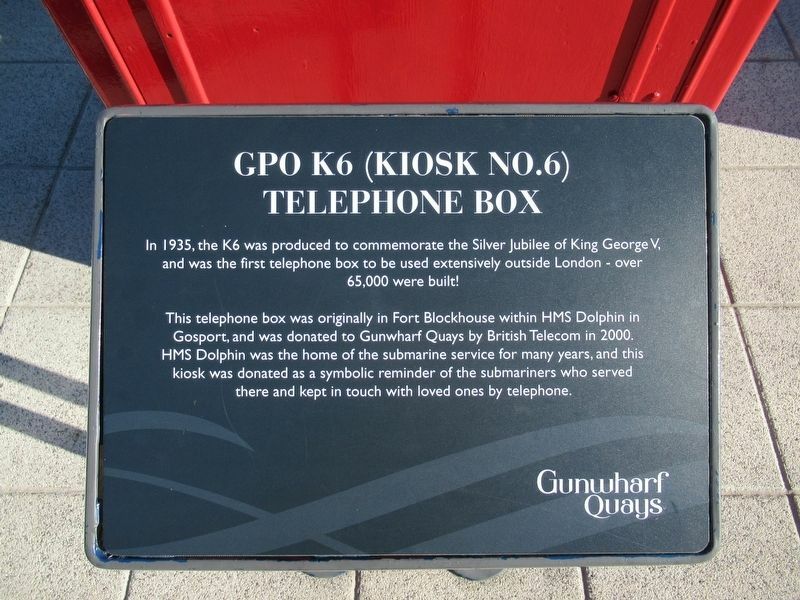 Search the internet for GPO K6 Telephone Box. Credits. This page was last revised on September 16, 2018. This page originally submitted on September 16, 2018, by Michael Herrick of Southbury, Connecticut. This page has been viewed 44 times since then and 5 times this year. Photos: 1, 2. submitted on September 16, 2018, by Michael Herrick of Southbury, Connecticut.